Notes: During the construction of the West London Railway a station was built in 1840 on the north side of the Kensington Canal basin consisting of a very small building and was on a short spur accessed by a turntable from the southern end of the line. Although close to the canal basin. the station couldn't be seen from Hammersmith Road so before the station was opened a new site was selected on the north side of Hammersmith Road. The platform is shown at the new site on a map dated 1841 although the station wasn't authorised by Robert Stephenson until September 1843, although this might have referred to the building to be erected on the existing platform. The station which had a single platform opened on 27th May 1844 closing again on 1st December 1844 when the line closed to passengers. Prior to the opening of the West London Extension Railway, the LNWR introduced services from Camden and Harrow to the old terminus at Kensington. When the West London Railway reopened fully along with the West London Extension Railway on 1st April 1863 a third Kensington Station was being built north of the second site but initially the second station was used for this service until the new station was ready for use on 1st July 1864. During the 1830's, the impending establishment of the London and Birmingham Railway (in 1833) and of the Great Western Railway (in 1835) was causing uncertainty about the future development of communications throughout west London. Neither company had yet decided upon the site for its permanent London terminus. But even before their incorporation as a company the directors of the Great Western Railway had in 1834 considered building a goods terminus beside the Kensington Canal basin, giving them access by water to the London docks. Construction started in 1836 with Sir William Hosking as engineer. 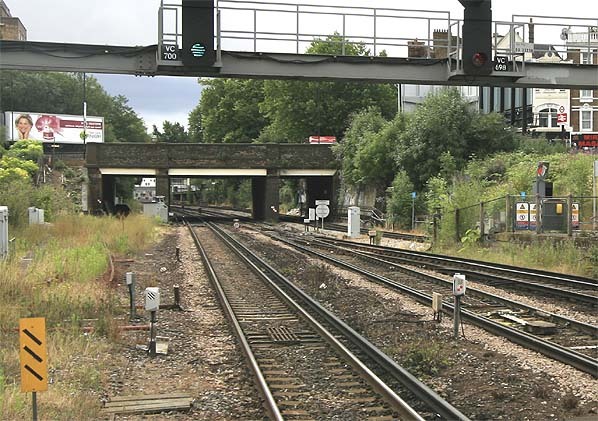 The new line left the London & Birmingham Line at Willesden running south across the Great Western on the level where an interchange station was to be built with platforms on both lines. A further station was to be provided at Shepherds Bush before the line reached its southern passenger terminus at Kensington from where it passed under Hammersmith Road to a goods yard adjacent to the Kensington canal basin near Warwick Road. The line remained in service as an important freight link. After the war only the short section of line between Kensington and Earls Court was reopened for passenger traffic with the service being provided by London Transport’s District Line from 19th December 1946, but only when there was an exhibition at Olympia. A workmen's steam hauled passenger service ran between Clapham Junction and Kensington with two trains in the morning rush hour and two in the evening. With the closure of Nine Elms depot in 1967 diesels took over the service. This service received little promotion and most people were unaware of its existence. Most of the conductor rails between Kensington and Willesden were removed between 1946 - 1952. Map of Metropolitan Railways and Improvements sanctioned in 1866. Published by Edward Stanford. Although Kensington Station was resited to the north in 1864 this map still shows it at its earlier site. 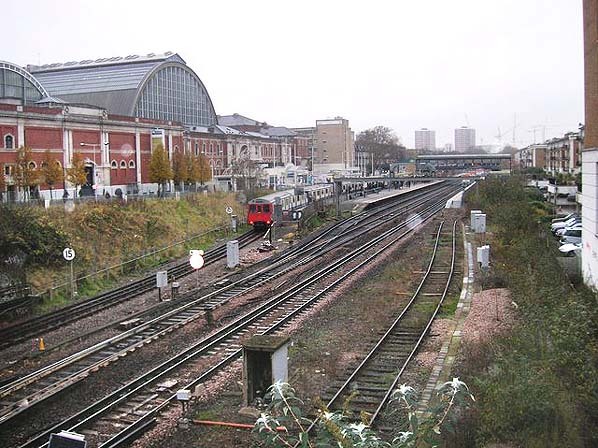 The site of the second Kensington Station (in the foreground) looking east in November 2007. The later station is seen in the background.